When it comes to cramming features and performance into laptops and undercutting rivals on price, few manufacturers can match Acer. The Acer Aspire 5101 AWLMi boasts an incredible specification for the money and, on paper at least, looks like it may run away with the awards. At the heart of the machine is an AMD Turion MK-36 processor. This is the latest budget chip from AMD and, with a clock speed of 2GHz; it's the fastest processor in the group. 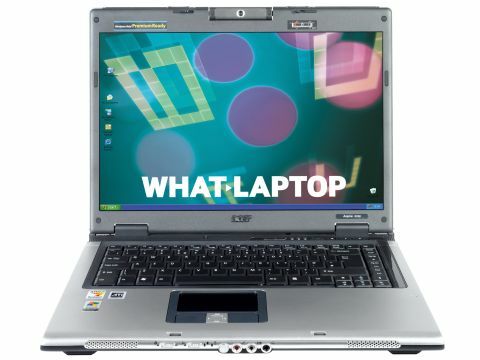 The Aspire is the only laptop on test to feature 1024MB of DDR2 memory. It also offers the most storage in the group, with a 100GB hard drive that spins at 5400rpm, ensuring applications load without lag. It's MobileMark 2005 score of 208 points is average. The battery life of just 155 minutes, under test, falls short of the three-hour minimum we expect from a laptop. This is a shame because, at 2.7kg, it's one of the lightest machines on the market. The 15.4-inch screen features a Super-TFT coating, giving the colours depth and vibrancy. Coupled with a 16:9 aspect ratio, it's an ideal machine for watching DVDs. Designed to work with AMD's latest processors; an ATi Radeon Xpress 1100 graphics chip supports the display. This is an integrated GPU using up to 128MB of system memory, and is on par with Intel's latest 945GM chipset. Installed in the Acer, it offers the highest 3DMark 2003 score in the group - 1412 points. However, while you'll have no trouble with office tasks, gaming and graphically intensive applications are still the preserve of more expensive systems. The large screen creates plenty of room throughout the chassis, and Acer has used it well. The keyboard is well spaced but, while firmly attached, flexes slightly under use, which is the only area where the Aspire 5101 feels less than impressive. The chassis is made from sturdy plastics. A large touchpad mirrors the display, and you'll also find a good- sized palm rest. When it comes to connectivity, the Acer is a mixed bag. 802.11b/g Wi-Fi offers a rapid connection to wireless networks, but fixed networking is limited to 10/100 Base-T speeds, rather than a quicker Gigabit Ethernet adapter. A VGA-out allows connections to external monitors or projectors, but any form of digital connectivity has been omitted. You'll find a 6-in-1 card reader, and Acer has also included a multi-format DVD rewriter. With a comprehensive features list, above-average build-quality, and a specification resembling that from a higher price category, the Acer makes a compelling choice.